Peanut Butter Blossoms – How Bad Can That Be? Right after you pull them out of the oven, the chocolate kisses are inserted in the center. You can have all the best cookbooks in the world, but sometimes, the best recipes are found simply on the back of packages. Earlier this week I bought some candy for my office and there on the back of the Hershey’s Kisses Package was my all time favorite recipe for Peanut Butter Blossoms. It all starts with shortening and peanut butter, and in the words of Ina Garten, “How bad can that be?” You just can’t go wrong with the classic combination of peanut butter and chocolate rolled in sugar. Not to mention how cute they look. As soon as they come out of the oven, you put the chocolate kisses in the center. The heat from the cookie slightly melts the chocolate and when you bite into it, its pure bliss. 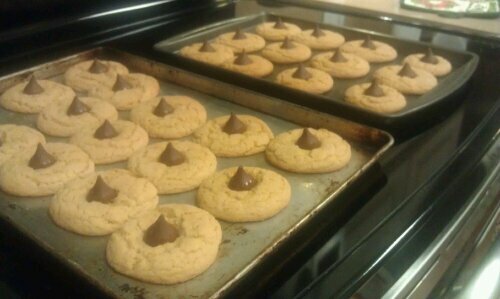 As I baked these, I listened to my Miranda Lambert Pandora Radio station and all was well. Pour yourself a cold glass of milk and enjoy these next to the Christmas tree. Happy Baking to all!